Direct Drive Portable Industrial Blower. 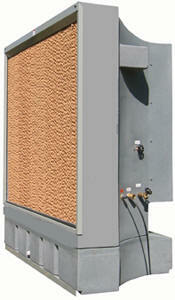 Heavy Duty Portable Evaporator Coolers. Whether you need to install air flow machinery and industrial fans through the workplace to improve staff comfort or to ensure that solvent fumes are properly vented from the premises, the range of different industrial blowers and fans available means that any business can be sure of getting exactly the right equipment to get the proper balance of fresh air and comfortable temperatures that makes the workplace more comfortable. The most basic kind of industrial fans are simply scaled up versions of the fan that you see on a desk. The difference of having more power of course means that the fan is more effective in pushing air through a larger environment without problems. A fan blade size of 24 or 20 inches means that these fans are more than capable of keeping a worker cool during the hottest part of the day. You can choose from portable or fixed industrial fans. The advantage of a portable model is that it can be moved and used in the area where it is most required. As a worker moves from one place to another, they can take the fan with them. The major disadvantage of these fans is that they have a trailing wire which if not properly placed can be a tripping hazard for other workers. A fixed fan can generally be a little more powerful than a mobile model of the same size because it is fixed into place and more stable, although it is a less flexible solution in a dynamic environment. For larger work areas, industrial blowers are a more appropriate tool for ensuring fresh air supply through the whole workplace. These stand alone fans, which boast fan blades more than 36 inches are ideally suited to an area where a lot of cooling is required. Blowers can generally be moved simply from one position to another as needed, making them perfect for an environment that can change rapidly. In order to properly vent noxious gasses and dusts from an environment such as a paint shop or machining centre, proper precautions must be taken and the correct filtration should be used. An industrial fan used for extracting dust or solvent fumes from a building must by law be connected to the proper air filters. These will take any harmful chemicals and dirt out of the air as it flows through the system and ensure that the air released into the environment meets with all appropriate guidelines. When an industrial fan or industrial blower is combined with a high performance air conditioning system, the work place environment will be improved for all staff. A cooler working environment will generally result in higher levels of productivity and activity amongst staff. This means that investing in the proper equipment to ensure a comfortable environment for staff will have sound implications towards increasing performance as well as improving morale and maintaining adherence to any appropriate legal and federal guidelines on air quality. Easy Rack carries a wide variety of commercial shelving, material handling equipment, commercial lighting, used pallet racks, and modular prefab buildings installed nationwide. If you can not find what you are looking for call us toll free at 1-888-776-3720 and we will find it for you. Our home office is located in Houston, Texas with regional distribution centers located in all 50 States including New York NY, Los Angeles CA, Miami, FL. Chicago, IL. Denver CO., Dallas TX, San Antonio, TX, Austin, TX, Boise ID, Atlanta GA, Albuquerque NM, Raleigh-Durham NC, Washington DC, Albuquerque NM, Huntsville AL, Fayetteville AR, Norfolk VA , Madison WI. Related Articles:Loading Dock Equipment, Drum Handling Equipment, Fork Truck Attachments, Gantry & Jib Cranes, Industrial Digital Floor Scales, Industrial Fans, Heaters & Blowers, Industrial ladders, Loading Dock Equipment, Miscellaneous Material Handling Equipment, Packaging Equipment, Pallet Trucks & Pallet Jacks, Scissor Lifts & Work Tables, Steel Dumping Hoppers, Utility Carts, Steel Security Folding Gates. Quartz infrared portable heaters offer the opportunity to bring a scalable and robust heating solution into your workplace that can be applied on either a localized or general basis according to the individual needs. Infrared Patio Heaters! It is possible to install industrial patio heaters where appropriate in order to ensure that particular areas can be heated to the correct temperature. Infared heaters are simple and straightforward devices that have been around for years, but over the last few years, a number of advances to the design have made them even more efficient. The idea behind a commercial space heater is simple. A large reflective dish with a heating element in it is positioned either on the floor or in is suspended from the ceiling. Industrial Heavy Duty Portable Evaporative Commercial Coolers. hese Portable Evaporative Coolers have large internal water reservoirs that allow units to operate approximately 8 hours without being connected to an external water source. Commercial Portable Industrial Work Station Fans! Three speed, 120 volt, 1 phase, totally enclosed, permanently lubricated motor. Overall height of unit is 53". Head tilts 360°. Commercial Gade Low Profile Industrial Blower! Two speed, 1/4 HP, 120V, 1 phase, ball bearing motor, permanently lubricated, totally enclosed rotary switch, 10 foot long SJT type 3 conductor cord. Commercial Grade Industrial Work Station Fan. Three speed, 120V, 1 phase, totally enclosed, permanently lubricated motor Commercial Work Station Fan. Mount with one bolt or lag screw to walls, ceilings, work benches, machines or any surface. Commercial Direct Drive Portable Industrial Blower. Two speed, 120V, 1 phase, ball bearing, totally enclosed motor. Rocker switch. 15 foot long SJT type 3 conductor cord. 3 paddle style steel blades. Industrial Duty Commercial Circulator Fan. Pull chain switch with a 12 foot long cord and an SJT type 3 conductor. Oscillating models available. Two speed, 120V, 1 phase, ball bearing, totally enclosed and permanently lubricated Industrial Duty Circulator industrial Fan. Dealer Discount Sales.